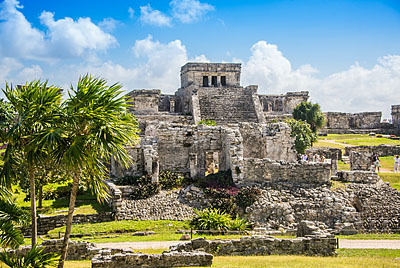 Escape to the wonders that surrounds the Riviera Maya, in this tour you will visit the archaeological zone of Tulum, the only mayan ruin built on the seashore and enjoy a walk along the popular Fifth Avenue in Playa del Carmen, a city that offers its visitors a variety of shops, bars, crafts and restaurants in a warm and friendly environment. 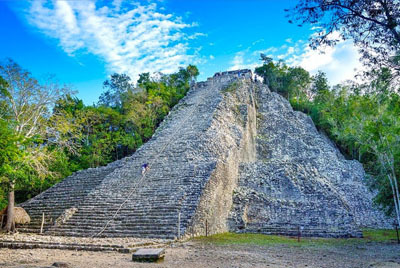 The Temple of the Descending God, Temple of the Frescoes, The Palace and El Castillo installed on a cliff with a cave in the interior was an important structure for the Mayan sailors. Your visit includes a bilingual guide, a light breakfast (box lunch), a waiter on the bus who will offer drinks on board (soft drinks, beers and water), entrance fee, a photomontage. You will have free time to walk the streets and buy souvenirs, take photos, or visit one of the shopping centers. It includes the experience of visiting one of the restaurants in the locality La Mission that will delight you with a dish with authentic mexican flavor. Important: The schedules are approximate and are subject to change without prior notice. Tips, souvenirs, crafts, clothes, etc. Pick up times: 7:00 a.m.
Children up to 4 years of age do not pay. On the way to Tulum, Playa del Carmen and back we will offer unlimited drinks: water, soft drinks and beers. You will enjoy a delicious meal with regional dishes in Playa del Carmen. We will take you to Tulum, includes a specialized Bilingual guide. 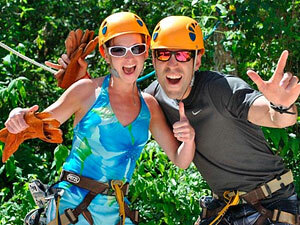 Pick up is available in most of hotels in Cancun and Riviera Maya. Exact time of your pick-up will be sent by email after booking.